Though Summer is far and away my favorite season, as fall approaches, I am getting really excited to transition from long days working outside on our farm back into the shop. My fall transition this year will be very different than it has been any year prior, however, as two pretty major life changes have come about since last fall: my husband and I sold our house with my shop and bought an old farm with an old shop that needs lots of work, and I’ve just been hired on as the Wood Studio Manager at Pratt Fine Arts Center here in downtown Seattle. Last fall, I had just obtained my Washington State Business License. I’d quit my job and was ready to commit to learning more about woodwork and doing projects full time. I had a fully outfitted, “perfectly” set up shop that was ready to go to work. I’d just been invited to attend my first woodworking conference, Woodworking in America 2014, and I had no idea how my life was going to change in the coming months. I left WIA with a job writing for Furniture & Cabinetmaking Magazine and offers to write regularly for several other publications. I had been offered the opportunity to take my Community Tool Chest idea on the road to several other woodworking conferences around the country. Along the way we found out we had to sell our old house with my perfect shop and would have the opportunity to buy the farm I’d been dreaming of having since I was a little girl. The farm has a 1000 sq ft shop, something that was originally a big selling point when we were buyers looking at the property. I had grand intentions of spending all my time and money fixing it up and turning it into the dream I have for it, but I’m beginning to realize there might just be too much there to bite off – at least to be ready for work this year. There are five pretty major projects on the docket in the shop to get it up and running: replacing the very leaky roof, adding a retaining wall to support the new roof, installing windows, adding a wood floor, and insulating/sealing off the hand tool area of the shop so it can be kept at a more consistent temperature and be sealed off from the dust from my power tools. Each one of these projects is a pretty huge undertaking in and of itself, but I’m confident that with the right group of helpers, everything will get done in due time. Though the dream for the home shop has been put off, I am extremely fortunate to have ample workspace in the shop at Pratt. 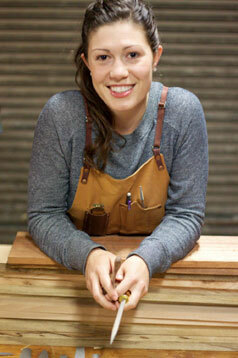 The opportunities for community, relationship, and gaining skill and confidence as a woodworker abound at Pratt. And I’m incredibly fortunate to be able to call something I love so much my “job.” So preparations for fall woodworking look like… I have no idea. But I’m really enjoying the ride. I enjoyed your blog. I wish I lived closer so I could offer you a hand. I am a professional woodworker and cabinet maker in New Hampshire. I am going to check into the book by Christopher Schwartz. I have not read a review on it before. It sounds interesting. Good luck with your shop repairs. If you need advice, drop me a line. I have 20+ years of construction experience I will share with you. Gotta go! Congratulations on all your new adventures and good luck with your coming transitions. Having been in a similar scenario regarding shop space a few years back all I can say is go slow, do it once and do it right. We will be looking forward to reading along as you tackle these next hurdles. Interesting. I have pretty much the same project at my lake house in Milledgeville. I have successfully replaced the roof, but I now must rip off the old Johnson Manville siding and throw that in the dumpster. Next, I must use an adequate insulation material and a house wrap. Then, I’ll need to install new siding. I mention all that because I had my best friend, the owner of The Village Idiot Carpenter Shop, who used inefficient insulation and forgot the house wrap..What happened? He got consistently foggy, smeary results when he finished wood during the winter. Why? 55 degrees Fahrenheit is the minimum temperature that stains and finishes can be exposed to. As an experienced finisher, I know that floor temperature as well as ambient room temperature both come into play for winter-time finishing.